“I would like to thank you for offering the course. I received my exam score and I passed. I owe it all to the classes you provided. And not just the material covered but the information on how to take the test was extremely helpful. I am recommending your classes to everyone I know. Thank you again. I passed! I am so happy! Yahoo! I contribute my success to your course. You do an excellent job and I learned/relearned so much. Thanks a million. I will say this, of all the courses I took in preparation of the PE test, I believe Test Masters prepared me the best. I would highly recommend anyone taking the test to take Test Masters as their primary study aid. I passed the exam!! After being out of full-time engineering for 20 years, I would never have been able to pass this test on the first attempt without your course. Thanks! I passed!! 100% thanks goes to this review course! I passed the exam. Thanks very much for all advice during course. Thanks for the course and your brilliant strategy. I thank you and the other instructors for helping to make the difference. I have already recommended Test Masters and will continue to do so. It has been 23 years since I graduated from college and thanks to Test Masters I passed the P.E. exam in Transportation on the first sitting! I want to thank you for your help because without it I couldn’t have passed. You gave me the limits of what I had to study (I graduated from the university more than 20 years ago). I passed! I’m so happy that I took your course. Keep up the good work! I dont think I could have passed it first time without attending the prep course at Test Masters. Thank you Test Masters!!!!!! I could not have done on the first try with the review classes. I do feel that [the course] was the difference in passing the test, particularly since I have been out of school for 33 years and spent most of the last ten years running an engineering company, rather than doing engineering work. I would like to thank you so much for all the information and help. I think the advice to rethink my exam discipline choice was monumental. Thanks again for the class. I’d like to thank you and all of your instructors for helping me focus on topics that are truly important. I can say with satisfaction that every minute of the review course, workshops and studying were well worth it! Many thanks to you and your staff for the intense exam preparation. I just wanted to let you know that I finally passed the Civil PE. It feels great, what a relief! I wanted to thank you guys for the all the help. If it wasn’t for your classes, I would probably still be studying for the EIT. I passed the test!!! I took Transportation on the evening portion. Thank you so much for all of your help. I really think that the Test Masters class made a big difference. I cant thank you enough! I passed the PE Exam. Thank you and all the instructors for their help, the class was a great help. Thanks for all of your help! Taking the review course definitely made a difference in my preparation and success! The key to my success in both exam passings, was your qualified instructors, the classroom setting, the acute focus on necessary material, and the wise advise given by the instructors to do the many practice problems in class in order to adequately teach and master those which presented on the test. I have no doubt that this course helped me pass the exam. Thank you for your class. It was the only reason I passed. I would like to deeply thank you for the P.E. exam review course that you offer. It was the first time I have taken the exam with your review course. The course you offer is excellent. I appreciate all the work and help from the teachers in the class. I felt the class was a big help in my ability to pass the exam. Your course was very instrumental in helping me pass the exam and I’ll highly recommend it to anyone who is planning on taking this exam. Thank you very much for the preparation – it truly made the difference. The test masters class was great. I was able to finish the AM session in about 2.5 hours. It was hard investing the money into your course but well worth it and probably the best investment I will ever make. I truly feel your review class put me over the top and allowed me to pass the exam. After failing the test on my first attempt, I signed up for the much talked-about Testmasters course. I certainly am pleased with the result! I thought it [the workshops] was well timed and provided excellent practice. The reference material, instructors, and direction for study was invaluable. I don’t know if I could have done it on the 1st try without Testmasters. It [the course] saved me a lot of time and got me to focus on important stuff very quickly. The course was perfect for me; it was all I needed to pass with flying colors. This is a huge accomplishment for me and I owe a great deal to the training you provided. The Test Masters Course and Workshop gave me the confidence to take the exam without the usual test anxiety. I have little doubt that I would have passed this time if I had not taken this class. I do think it is worth every penny. I passed first try without much additional work outside of class. I think it was worth every penny. I PASSED! I know you go to major effort for the success of the students and it definitely shows. I truly believe that the testmasters course is what made it possible. Instead of blindly studying at random, the class gave me great guidance on what areas to concentrate on with my studies. It [the course] forced me to prepare my notes and thoughts to where I was able to work problems quicker and in a more organized manner. I would have never passed the PE exam on my first try if I had not attended your courses. It was a very small price to pay to attain my PE license. I feel that I would have not had the tools and the confidence if I had not taken the Testmasters review class. I want to thank you and your staff for giving me the tools necessary to reach this important goal in my life. The course is extremely helpful in targeting the areas that I would need to know the most about in passing the test. You and your instructors are well worth the cost. Thank you all so much for the course – I feel that both the FE and PE courses made the difference for me on both test, given that I had been out of school for 10+ year. I will definitely recommend the course to others. I am a firm believer in your method of teaching/reviewing, and have seen great personal benefit from it. I truly believe that I could not have passed if it hadn’t been for your course. I will definitely recommend your course to future takers that I come across! It was worth it! The class was a great study tool and guide. It gave a good outline of what I needed to study and where to concentrate. I am happy to announce that I passed on my first try. Your PE review course helped me focus on things that I needed to focus on. The class is paramount to somebody like me who doesn’t have a lot of time to study and dig into big reference/prep books and sort out topics by recurrence frequency in the exam. The class organized my thoughts and helped me invest my limited studying time on the material that’s going to make me pass. It helped me a year ago with the FE and today with PE. I just received my exam grade and I scored an 85 on the general civil with emphasis on structural PE exam. Taking your course made all the difference. I wish to express to you my gratitude for the Test Masters course and the quality of the instructors and materials that were provided in the course. After making several attempts at passing the PE exam on my own, I was able to use the knowledge and skills in this course to finally pass! I learned yesterday that I passed. Thank you for the course, it would have been impossible for me to pass without it. Thank you so much for this course. It really did make the difference between a pass and a fail. I checked my result last night with all my family. We were celebrating my passing (77). I really thank you for providing such good review courses. I learned a lot and that saved me a lot of time. Words can’t express the joy I am having. Without the continued support of Test Masters, I don’t think I would have passed the PE examination. Test Masters prepared me for both the EIT and PE exam and I am grateful. Your attention to detail and solid course preparation definitely helped me pass. There’s no question that I will recommend the class to friends taking the exam. Thank you to you and your staff for helping me focus my studies on the most critical subjects to pass the exam the FIRST time!! Looking back, I believe the course was very instrumental in my passing the examination. I would recommend it to others. Not only does the course give a great structure for what to study, but it outlines great tips for how to approach the test and how to take it. I am certain had I not taken your refresher course, I would NOT have passed. The instruction received and the test taking tips were vital to my performance. Your classes did provide a thought process for attacking and completing the problems. I think this methodology WAS of great benefit during the exam. Your class was also helpful in identifying the “traps” which were present in some questions as well as how to eliminate answers from questions which were pure guesses thereby increasing the odds of guessing correctly. Once again, I am convinced that your class is directly responsible for my passing the exam. The benefit I received by attending your classes far outweighs the cost. 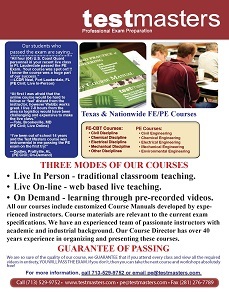 I would like to take the time to thank Testmasters for the PE refresher course offered in Richmond VA this past fall. I was fortunate to pass the exam on the first attempt. I had taken the PE twice before and missed it by 6 points. After taking your class I was able to raise my score 14 points and I passed. The course was awesome. I took the PE – Transportation depth in the PM. This was my first attempt at the exam and I feel that your course helped tremendously. The best aspect of the classes was the problem solving sessions, specially the method in which you coached from the examination point of view, do some theory and solve related problems. This class was the difference in the exam. I improved 11 points from last time. Thank you very much for this course it was well worth the investment of time and money. I truly believe that without your course and a lot of praying I could not have passed the tests (EIT/spring, PE/fall). Your ability to “push” your students may not be totally appreciated until after the exam results are known. Simply put: THANK YOU VERY MUCH for your help and guidance. The class helped me to focus on the important topics from each of the five major subjects, and not to become overwhelmed and discouraged by the quantity of material presented in many of the reference books. Thank you for all your hard work and excellent review course. I passed with a 75 on the first try after taking your course. I strongly believe that the course made the difference. I am grateful and thankful for all your help, knowledge and support, and I know you will continue to have the same success with your classes. I talked to my other 6 colleagues that took the exam and were at the prep course this past October and they all passed. I passed. I thought it was something definitely out of my reach, being out of college for over 20 years. But, with what test taking skills and refreshers I received, the impossible became possible. Your class really worked! I passed the Civil PE exam up here in Oklahoma on the first try! All of those long weekends driving to Dallas were worth it. The class was worth every penny. The course did a good job of explaining the subjects in enough depth to make most of the exam very straightforward.